The moment that I've been dreading arrived last weekend ... my son left the nest to share a house with some friends. From the moment of his birth, my brain has known and accepted the inevitability of this day and is quietly celebrating for him, acknowledging the growth and development it will provide but my heart just can't get with the program! I made this house-warming card for the trio of young men. The inspiration for the layout came from an old sketch for a challenge run by the talented Dawn Olchefske: DOstampersstars Thursday Challenge DSC#082. He and his friends have already embarked on a steep learning curve and have been measuring, dismantling and reassembling things. I chose some papers from the Serene Scenery paper that were masculine and also reminded me a little of textures that one might find around the house. I chose the Nailed It Bundle partly because of its masculine appeal and also partly to celebrate the development of their home-maintenance skills! The ruler, nuts & bolts and shaft of the screwdriver are all cut from Silver Foil Sheet. 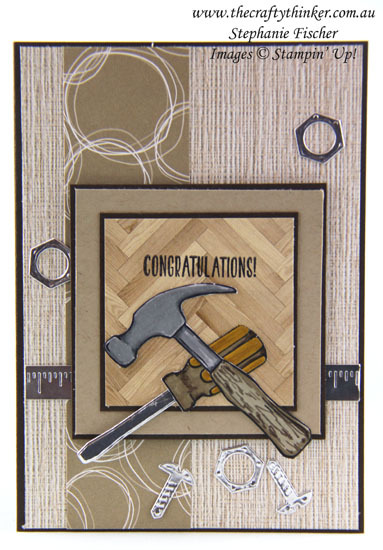 The entire hammer and the handle of the screwdriver are stamped with Basic Black ink onto Whisper White card and coloured with Stampin' Write Markers. I chose to hand-cut the hammer and screwdriver handle because, for this particular project, I didn't want a white edge around the images. The greeting is from the Tasty Trucks stamp set - free during Sale-A-Bration with any order of $90. Sale-A-Bration runs only until the end of this month - so make sure you take advantage before it's too late! The nuts and bolts continue inside the card but this time they're stamped. 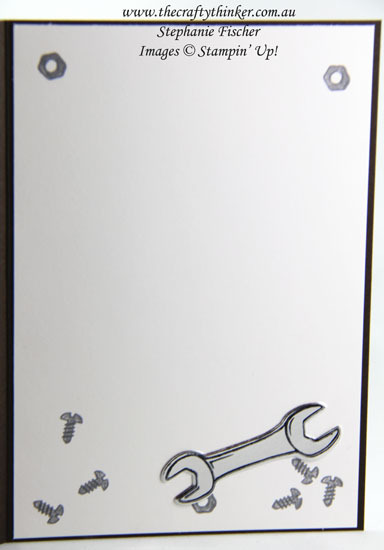 Inside the card, I used Basic Gray ink to stamp the nuts and bolts and then coloured them with a Smoky Slate marker. I stamped the spanner onto Silver Foil Sheet with Jet Black Stazon ink and cut it out with the matching die before gluing it into position.